Winter brings with it a generous harvest of tropical fruits. And though National Mango Day is August 14th, you’ve probably noticed some good deals on mangoes lately. I scooped up a basket full of them to make a big batch of Indian Mango Chutney to bottle. 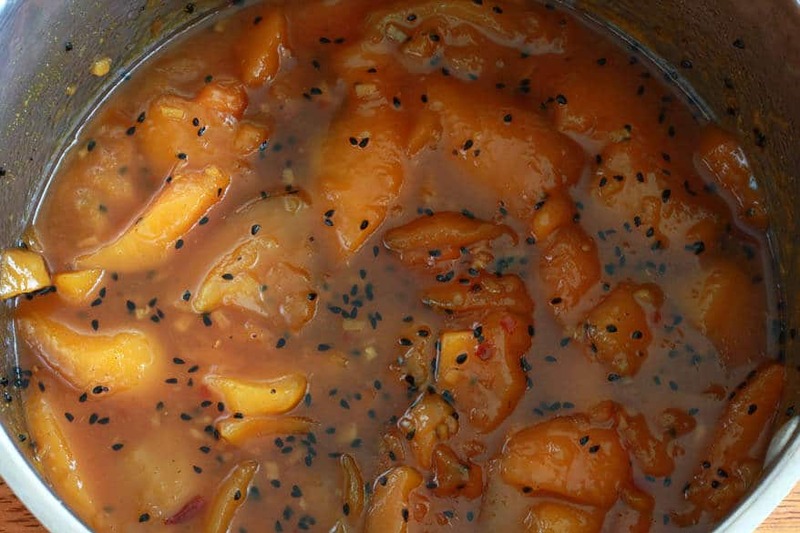 Here is a recipe I developed a few years ago for an Indian Mango Chutney. It’s sweet and spicy and is delicious either as a spread, a dip, or used in cooking a variety of Indian cuisine (recipes will follow!). 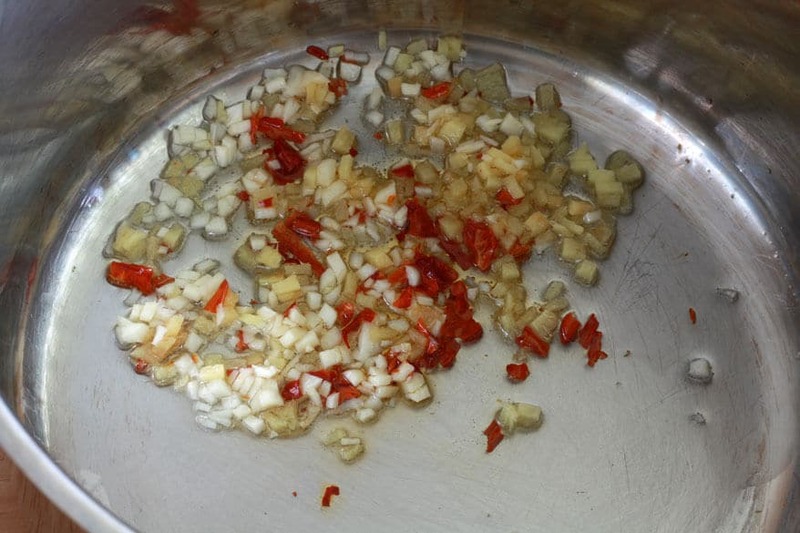 Ginger, garlic and red chilies are sauteed in oil and then cumin, coriander, turmeric, cloves, cinnamon and cardamom are added to coax out their robust flavors. 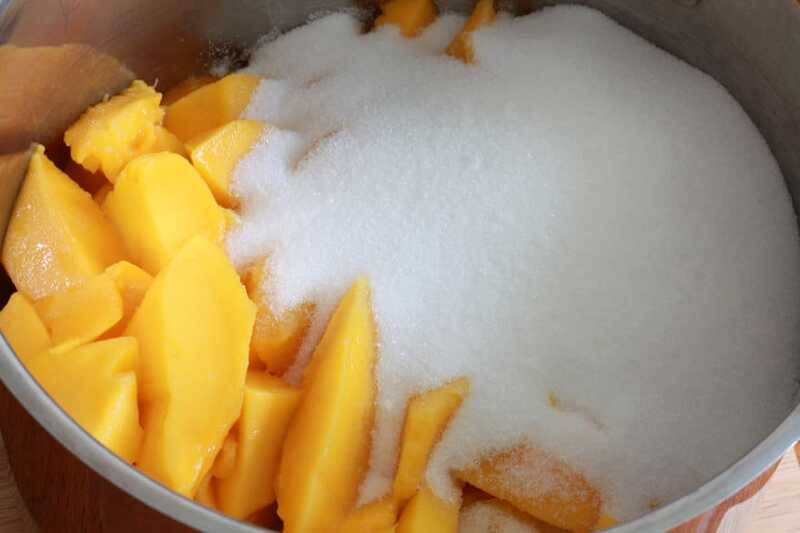 Fresh mango, sugar and vinegar is added and it is slowly cooked down to a sticky and delicious concoction. 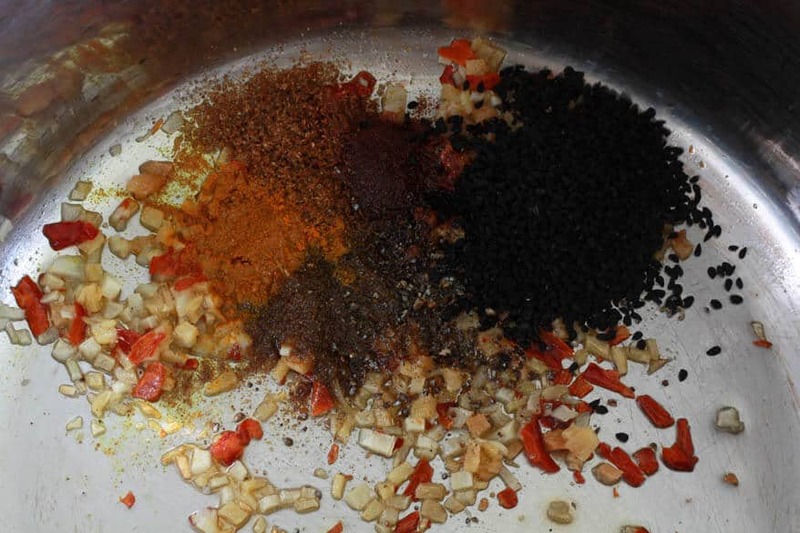 Another spice that is in this recipe is nigella, which comes from an annual flowering plant native to south and southwest Asia. Other names for it include black cumin, onion seed and kalonji. It’s hard to describe the flavor of nigella. Wikipedia describes them as “a combination of onions, black pepper and oregano, with a bitterness like mustard seeds.” The flavor is really unlike anything you’ve tasted before. It’s fantastic! I love to use it at every possible opportunity when I make Indian or Middle Eastern foods. It’s wonderful in curries and it positively transforms breads and potatoes. Nigella is commonly sprinkled on naan bread in India and is a wonderful spice to use in any “carb-based” dish. 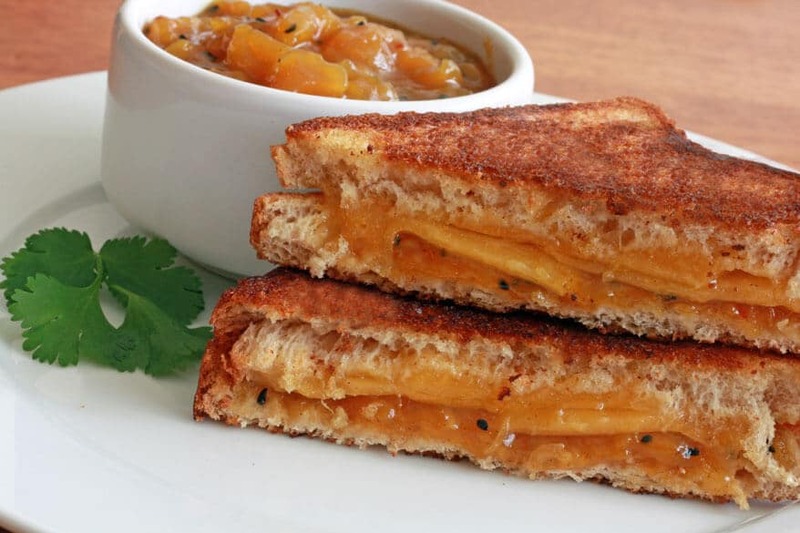 It’s adds a delicious dimension of flavor to this mango chutney. *and be sure to sign up for my FREE newsletter so you never miss a recipe! So happy to have you on board! Now, let’s get started on that heavenly chutney! You’ll need about 4-5 ripe mangoes. 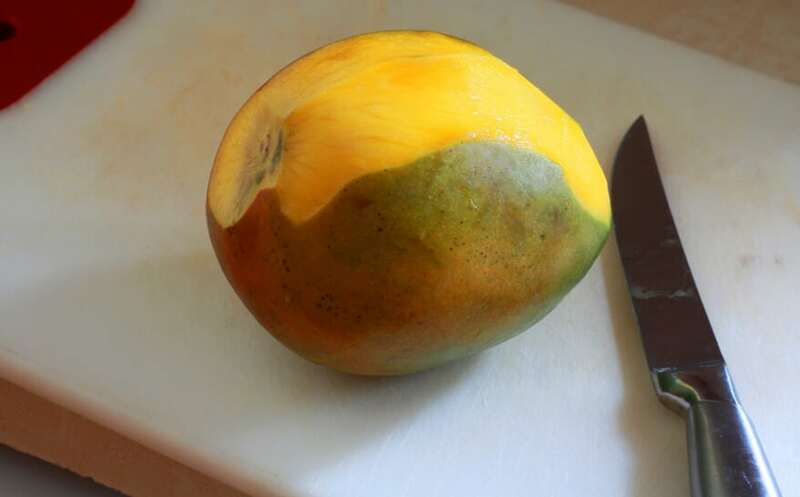 Cut off as much of the mango off the stubborn pit as you can and chop up the mango flesh. Set aside. 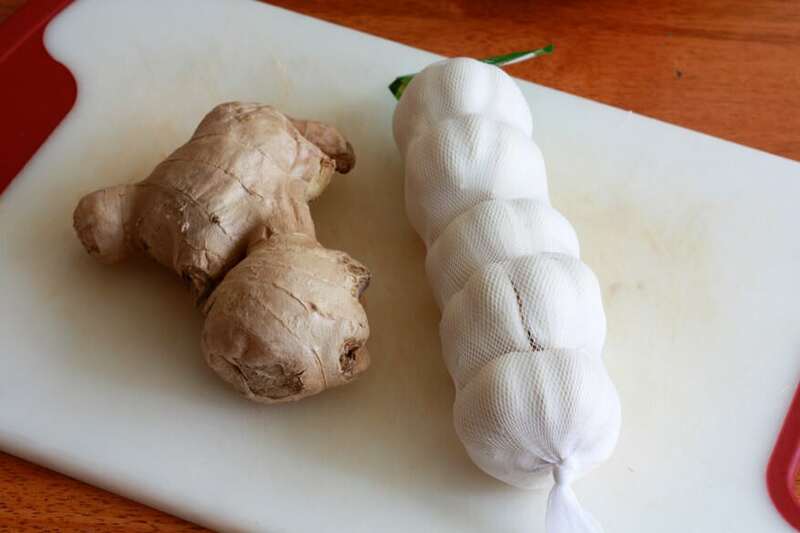 Get some fresh ginger and garlic. 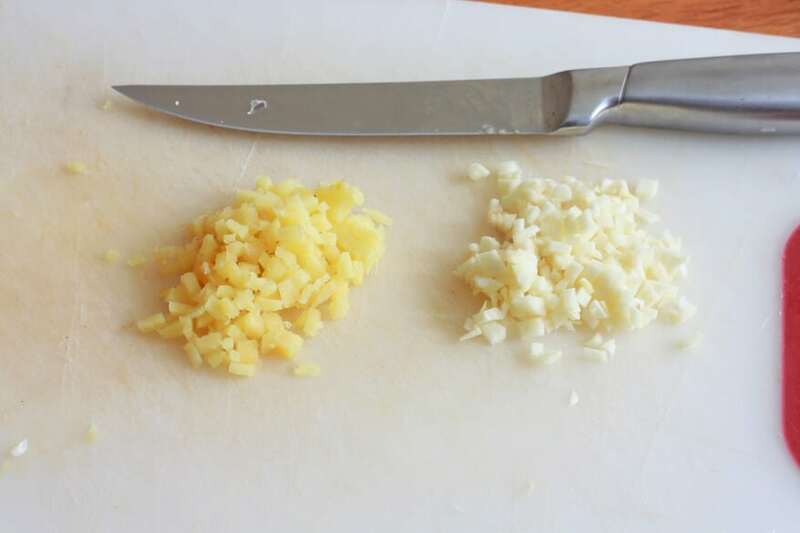 Finely mince the ginger and garlic. Over medium-high heat, heat some vegetable oil in a medium stock pot and saute the garlic, ginger and some diced red chilies for about a minute. Add the spices and saute for another minute. Add the chopped mangoes to the pot. Stir up the mixture and bring to a boil. Reduce the heat to medium-low and continue on a steady simmer for one hour. After an hour of simmering. 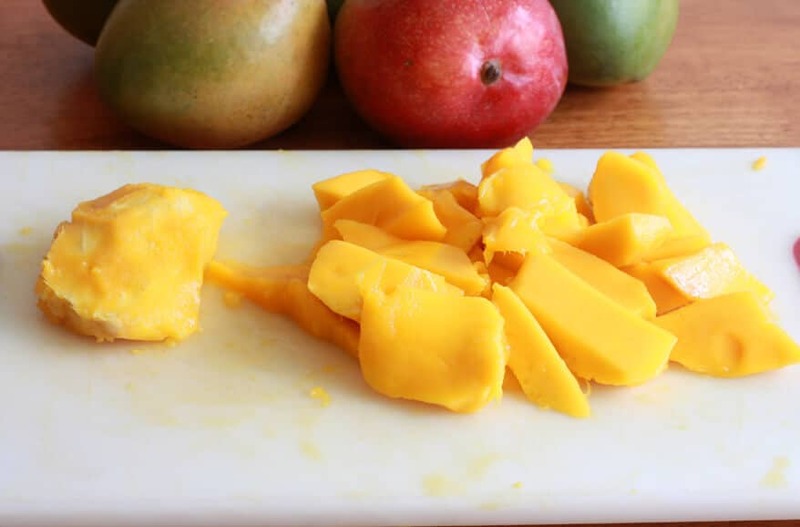 Depending on how finely you diced the mango, you can either leave it as is, or you can use a potato masher or blender stick to mash up some of the larger pieces. After a bit of mashing. Stored in jars in the fridge this chutney will last up to at least two months. You can also freeze it for several months. For long-term storage, can it in airtight jars: Pour the mixture directly into sterilized jars and process in a water bath for 10 minutes. Let sit undisturbed for 24 hours then store jars in a dark, cool place. Will keep for at least a year. Delicious as sweet and spicy spread, dipping sauce, or condiment to add to your curries. More food that I just love! Congrats on a delicious-looking recipe! Thanks, Johan, you have good taste! Thanks for visiting! Mango Chutney is my new favorite condiment. Have only had store-bought so far. Your recipe sounds really good and quite easy to make. Well done, Daring Gourmet! Thanks, Kathleen! Agreed – mango chutney is fabulous. For savory dishes, I use the Indian Mango Chutney you’re referring to. When I use it for making sweets and desserts, I leave the nigella seeds out. Thanks for stopping by and I hope you’ll visit again! After seeing all of your delicious posts using this mango chutney, I bought all the ingredients and made it! I was a bit scared, but after using your step by step pictures, it was actually easy to make and I felt like a little gourmet in training. Thanks! “Susan the Gourmet.” It has a nice ring to it :) Awesome! Glad you were daring enough to make it! And the chutney freezes really well. I freeze it in little plastic containers so that I don’t have to thaw the whole amount when I need to use it. It is deeeeeelicious adding some of it to an Indian curry. Love your Blog, I am new here but I have made so far 2 recipes, Loved them!! Hello and welcome!! Thank you so much for the compliment! Which recipes have you made so far? The write-up of the recipes with pictures is beautiful and tempting. I wish you would have used a different picture on the contents page because that one looked like vomitus to me and I almost looked no further. Fantastic, Eva, that is quite the compliment! :) Thanks so much for the feedback! How many regular sized jam/chutney jars does this make? Hello! This recipe yields approximately 5 one-pint jars of chutney. Thank you, Joyce, and welcome! I’m happy you’re making this recipe! When I make it I’ll sometimes divide the recipe between two pots so I can make one with the nigella seeds and one without (for the few items that are strictly sweet-based). I love adding this chutney to curries – its adds such a wonderful flavor to the finished dish! I hope you like it! P.S. Someone just left a comment a few days ago about preferring to use less vinegar. The vinegar level of this recipe is comparable to the Indian chutneys I used when I lived in the UK and it’s the standard amount that’s typically used for mango chutney. Still, the amount of vinegar can be tweaked to whatever your personal preference is. Let me know your thoughts once you’ve tried it! This looks like a wonderful recipe for mango chutney…lots of spices :) I just love chutneys and Indian food! Just came across your blog yesterday and am loving your recipes, looking forward to following your posts. Thanks so much, Nerissa! 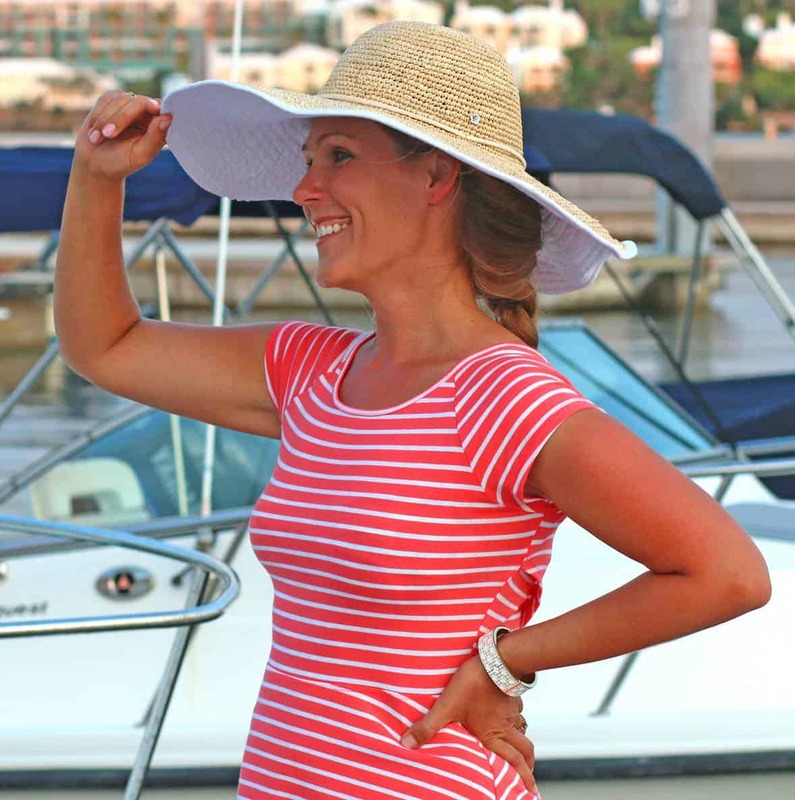 I’m thrilled you found my blog – welcome aboard! Hi – just thought you would like to know I have used your recipe as the basis for an Indian-style plum chutney. I love very spicy chutneys, so couldn’t find a recipe for plum chutney that really suited me, but thought, that as plums are sweet and perfumed, a little like mangoes, it might work to use a mango chutney recipe. I tried it, and it worked – we have lots of delicious Plumgo Chutney… Thanks so much for your very helpful instructions and fab recipe. Definitely a Moghal era creation.This marvelous chutney contain all the ingredients to fully activate every taste bud of the mouth. For sure, AayArj, we love it! Just wanted to thank you for this recipe. The best one I’ve found! I return here every few months to whip up a new batch to always have around in the fridge. Thanks ! This is awesome! I doubled the chilli cos like it spicy. Would totally recommend! Wonderful, I’m glad you enjoyed it, Trace! Thank you for your feedback! Can’t wait to try this recipe, it’s definitely the most promising one I’ve found! One question: what do you think of substituting brown sugar and/or jaggery? If I do so, should I also adjust the amount of vinegar? Would the flavor of the chutney be greatly impacted? Thank you for the compliment, Mary! I haven’t tried it with brown sugar before, so I really can’t offer an opinion. Brown sugar is simply white sugar with molasses added to it, so if you do use it, you wouldn’t have to adjust the vinegar. Yes, two cups of brown sugar would alter the flavor of the chutney, but whether that alteration would be a good – or not so good – thing, I’m not sure. If you experiment with that, let us know how it turns out! Haven’t checked out your blog in some while, but saw this and had to come here and comment! 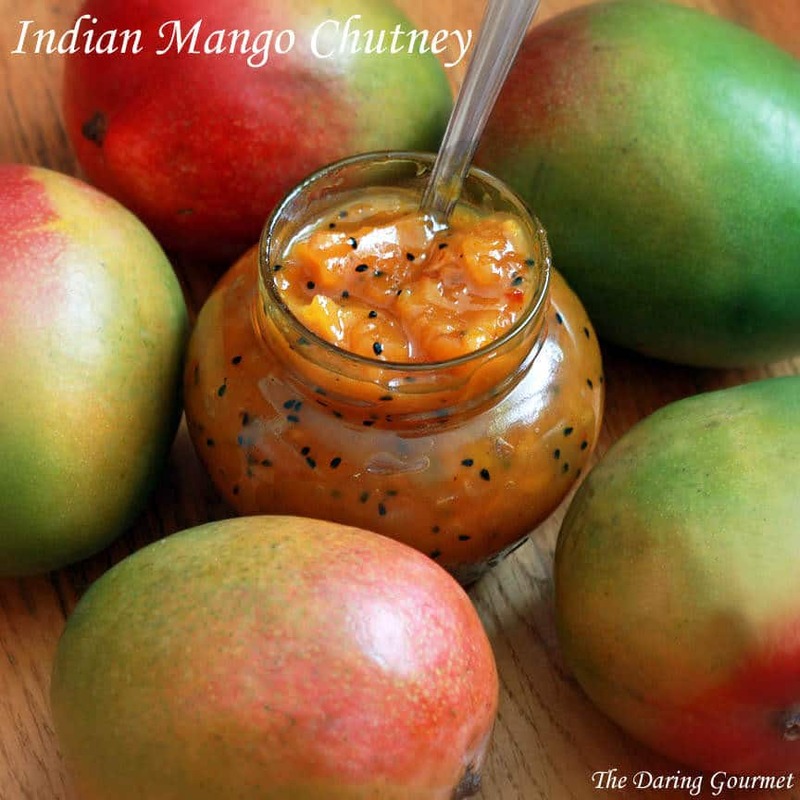 ..
We eat mango chutney a lot, but not in the ways you have used it – very interesting! Need to try them out. Do you get raw mango’s there? We make mango chutney and different kinds of mango pickles along with sherbats only from the raw mango (its known as Keri), so the flavor is more tart than sweet. 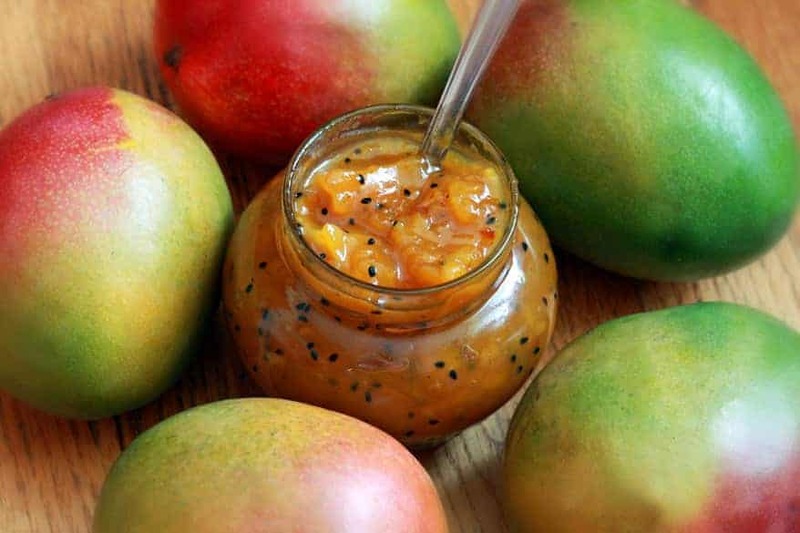 Still waiting for proper mango season here (it stats mid-may) then I am going to try this variation of chutney as well. Hi Kiran! I love adding this chutney to some of the curries I make. It adds such a wonderful depth and flavor dimension. And, of course, I love using it as a dip for naan. Raw mangoes are next to impossible to find here, so we just use what we have available. Thanks for visiting! Mango Chutney is a fave, I just love it! I really need to try this one. Thanks for the recipe, Kimberly! Thanks, Del! I LOVE what it does to transform a curry. Absolutely divine. Fun to make! Thank you so much for a wonderful, delicious Sunday family dinner. I’m thrilled to hear it was a hit, Ang! Thank you for your feedback! Hi, found your recipe this morning, had bought a case of mangoes and was planning on making chutney. Loved the look of this recipe and have just made it, it is simmering on the stove as I write. I know it will be delicious and plan on making a second batch tomorrow. I love to give my home made chutney as gifts at Christmas….if it lasts that long! Really into cooking Indian food, so cannot wait to serve this up with it. Hi Sandra and welcome! I’m thrilled you found my site and are making this chutney! We love it. I use it regularly in my Indian dishes and always like to have plenty on hand. I’m on my last jar right now from last August and the flavor or seems to get better with time. 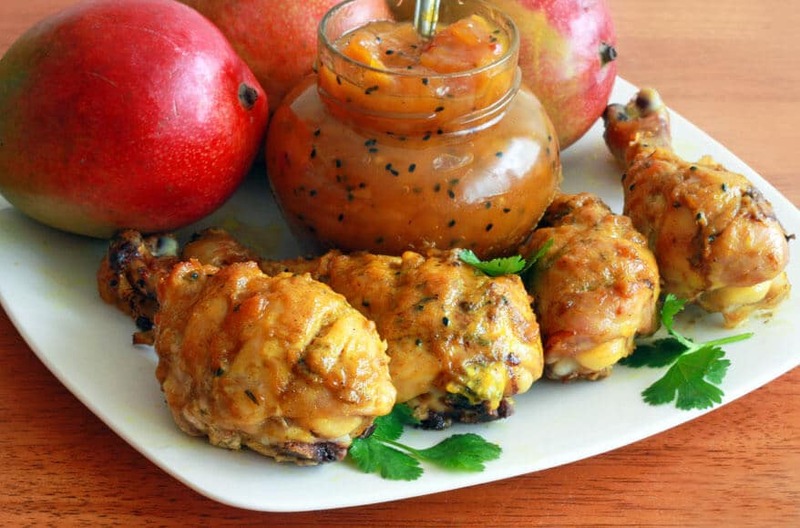 Last week I used it again to make my Mango Chutney Chicken. Give that one a try and you’ll love it! I love to give this chutney away as gifts as well. Happy chutney-making! Kimberly, thank you so much for the chutney recipe! As everyone else, I loved it. I live in Miami and have made a lot of chutney from the mangoes in my yard, but yours is the best for my taste. The only thing I changed was that I mixed hard ripe and ripe mangoes. I bought nigella seeds, but never knew a good way to use them. Now I will experiment, thanks to you. Thanks again for this website….I will also be making the mango chutney chicken tonight. Your work is much appreciated. Yes Kim, the mango chutney chicken was a hit! My husband wants to know when I will be making it again. At this rate, I will go through my chutney fairly quickly,….better make some more! Keep on cooking!! That’s wonderful, Sandra, I’m so glad you both enjoyed it! The Mango Chutney Chicken is a regular in our home. And yes, I always make sure to have plenty of that chutney on hand :) Thanks so much for your feedback! Hello Kimberly, I’m going to try your recipe today after I pick up some kalonji at my local Indian market. Question: do you have a nutritional breakdown for your recipe? Hello, Heinz! I do not have the nutritional breakdown, but there are many websites where you can enter the ingredients and their quantity and they’ll generate all those details for you. Just two examples are caloriecount.com and fitday.com. Happy cooking! Hi again! Everybody loves your chutney that I made from Lippens mangoes. I am wondering if you have ever tried it with a sugar substitute like pineapple juice? My son hates vinegar, but loves mangoes. I want to make him small amounts for his Bento Box to take to school. Pineapple juice would lower the PH so that I might not have to add vinegar. Maybe some lemon juice… Do you or any of your subscribers have suggestions for me? Hi Deborah, I’m happy to hear it was a hit! I have not tried a sugar substitute with this chutney but it can certainly be done and yes, pineapple juice is a common choice. An online search of using pineapple juice as a substitute for sugar in canning will yield a lot of results with information, here is just one of many. Keep in mind that since you’re using a liquid sugar substitute the chutney will be very liquidy so you’ll need to add pectin at the very end and boil hard for a minute to firm it up. For the purposes of lowering the pH level however, pineapple juice won’t work. Lemon juice will. I haven’t tried making this recipe with either substitute so I’m not sure what the outcome will taste like. If you give it a try let us know! Omg! This was delicious and easy. My husband is from India so I am always intimidated to share indian dishes with the sister-in-laws. They were all raving about my mango chutney and asked me to make more. What a hit – thank you! The best chutney recipe I have found on the net! Thank you very much for sharing it! You are very welcome, John, I’m thrilled that you enjoyed it so much! i also try this. chutney is very tasty .nice steps nice description. So happy you enjoyed it, thank you! Hi Noopur, I’m not sure what the exact ratio of ingredients is. If you want to make less I would simply cut the recipe in half, it makes for much easier adjustments. I haven’t tried making it with lemon juice but that would be a natural alternative to the vinegar. hi Kimberly, I tried without the lemon juice and I feel the chutney was missing a bit of the ‘kick’ which the vinegar brings in.. So will stick to using vinegar. Roughly 4-5 tbsp per mango works great!. Thanks so much for your reply and lovely recipe. Thanks for your feedback, Noopur, I appreciate it! I agree, the acidic element of the vinegar contributes a lot to the chutney. Can this recipe be stored on the shelf unopened? If you canned it using the water bath method to properly sterilize and seal it, then yes, it can be stored for at least a year, ideally in a dark, cool place. Kimberly, I am really new to all this and still have to learn to properly do the water bath method. So my question is, if you forgo sterilization, how long will it last in a jar in the fridge? Hi José! Well, that’s where U.S. standards and the rest of the world’s differ. Because of the high acidity content, anywhere else you’d be told that it will last for up to several months in the fridge, but here in the U.S. the likely recommendation would be up to one month. Another alternative is to freeze it. If you still have some left after a month it freezes quite well in small airtight containers. I’ve done this a few times and when I need it to add to a curry, I just take it out of the freezer and plop it in the sauce. Freshly baked naan bread is one of my favorite things as well. If you can get hold of some nigella seeds they taste SO good baked on the naan! Happy baking, Clifford! Kimberley, how much are the weight approximately of the 4/5 mangoes used? About 500g? Hi Sanmari! The average mango weighs about 200g each. So you’ll want about 800 grams of mangoes. Happy chutney making! Could this also be considered Major Grey Chutney..
Hi Nancy, I can’t remember the last time I had Major Grey, it’s been many many years, but I think this is similar, yes, except for the nigella seeds and Major Grey usually adds raisins I believe. You can definitely add some raisins to this recipe if you like. Just wondering about the mango if 200gms each is just the flesh, or the entire mango. i have four ripe medium size mangos weighing about 400grams each so wondering if I should double the quantities of everything else…. Hi Mikey, that’s for the entire mango. You need a total of 800-1000 grams and better too much than too little. Enjoy! Hello. My first time here. Have everything ready to make Mango Chutney – even the nigella – BUT having a hard time finding a red chili – do you use dried? can I substitute powdered? Thanks – I’m excited to try this. Hi Marcia and welcome! Yes, I use dried red chilies but you can substitute powdered. Depending on how much heat you like, be careful because a little goes a very long way! Hi Charlotte, greetings to Scotland! I have many great memories there. Yes, nigella seeds will probably be a bit challenging to find there. A well-equipped Asian store may have them but I’d recommend giving them a ring first before you make the drive if it’s a ways to go. They also go by the name of onions seeds and kalonji. And of course you can order them online (eg, Amazon and several other options). I will say though that you don’t need them for this chutney. I do like the flavor dimension they add, but it’s not necessary at all. This chutney will taste wonderful even without them. I’m so happy to hear that, Corina, thank you! delicious. slightly sweeter than i’ll make next time, but delicious. i couldn’t get nigella seeds, i suspect i used mustard seeds? i can’t remember. i used whole cardamons because i was too lazy to grind mine and there is a nice, subtle, cardamon flavour to the chutney. Mel, that’s not problem at all. The flavor actually gets better with time and as long as you process the cans for long-term storage they’ll last at least a year. I had one lonely mango that I needed to use so I decided to make chutney tonight. Did a search, found this page, and made 1/4 of this recipe. Wow. Very, very good. I make Indian food a lot (so I had Nigella seeds in the pantry) and this has to be the best mango chutney I’ve ever tasted. I wanted to just eat it out of the pan with a spoon. Thanks for sharing! Ed, I’m thoroughly thrilled to hear that, thank you! And that was very good of you to put that lonely mango to use, I’m sure it is much indebted :) Thanks so much for the feedback and I hope you’ll visit often! I made a trial batch of this yesterday and it is amazing. I have a Bowen mango tree that has produced a massive amount of fruit that needs using. I am about to make a huge batch up for the neighbors, friends and family. I gave some to my father in law yesterday and he ate it straight from the jar. Thank you for publishing this recipe it is an absolute winner. Fantastic, Matt, I’m thrilled to hear that, thank you! This stuff really is terrific, I make a huge batch a couple of times a year and find myself adding it to as many things as my imagination allows :) And yes, it makes such a fantastic gift! Super recipe goes perfectly with cheese, smoked fish and all sorts of( veggie) burgers. Actually I added it to any plate of food! So delicious. Thanks so much, Darna, I’m thrilled you like it! I agree, it really is the perfect condiment for so many things and you’ve given me an added idea – serve it with cheese, brilliant! Thank you! Just found your recipe via Google search and have the chutney simmering on the stove as I write. The smell is heavenly and I can’t wait to try it in some of the recommendations already mentioned! That’s awesome, Laura, so glad you found my site and this recipe! Great recipe. But don’t be silly. It makes FIVE pints?! Hi Neil, glad you enjoyed the recipe, thank you! It depends on how large the mangoes are. I use very large mangoes so it generally yields about 5 pints for me. Hi Kimberly. Neil is right – I’ve been making mango chutney for more years than I like to admit to, and wanted to try a new recipe. So I made this today, and processed it in a water bath. It looks lovely, and we can’t wait to try it, but the recipe actually makes five HALF-PINT jars. I measured and weighed my mangos as well to be sure that I was as close as possible to the recipe. 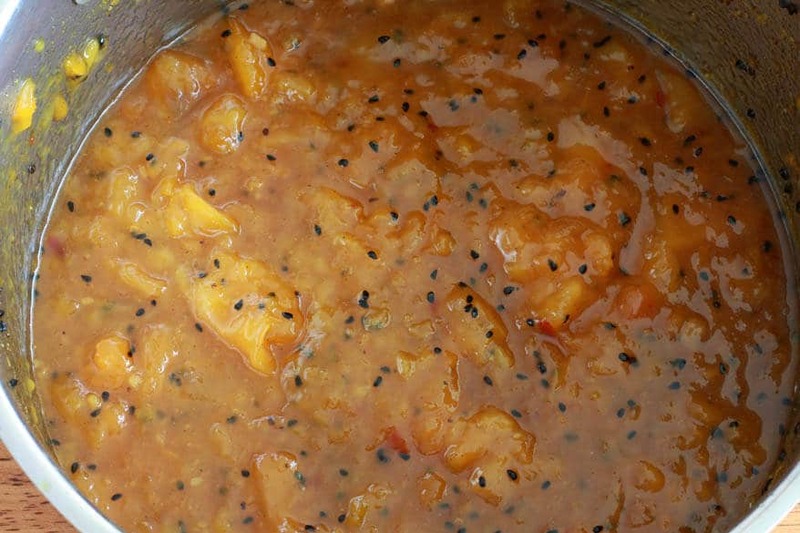 Hi, I just made this mango chutney recipe. My hubby and I love the flavours and the color – FAB! However, I was only able to fill 4 – 1/2 pint jars (8 oz). I weighed the mangoes (1000 g) before chopping, so I’m pretty sure the mango volume was correct. Any suggestions as to where I may have gone wrong? Hi Cathy, I’ll need to make another batch and weigh the mangoes to double check exactly how much this yields. In any case, I’m glad you both enjoyed this as much as we do and appreciate the feedback! 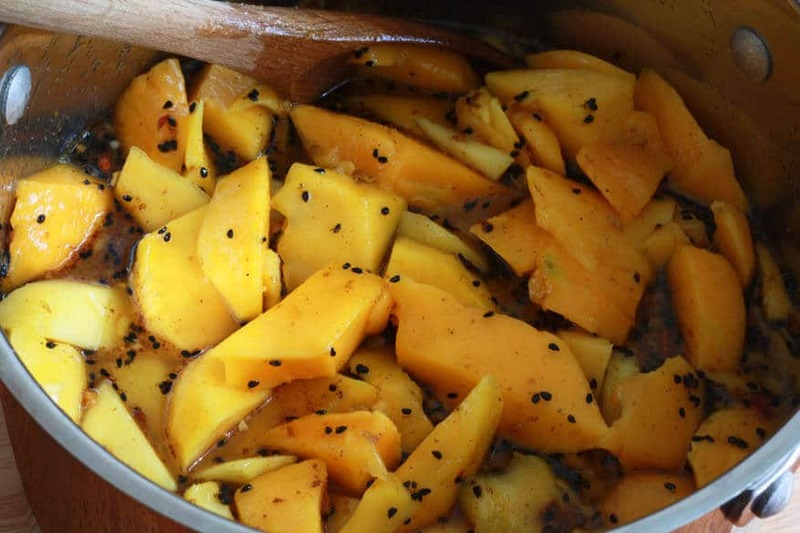 Hi Kim… Making the Indian mango chutney and having a hard time finding the nigella seed… is it sold in a grocery store or do you know where can I find it? Hi Margaret, no, you won’t find it in any grocery stores except for ethnic stores that carry Indian spices. Or you can buy it various places online – I’ve linked to one option on Amazon. Thanks for this amazing recipe. Just tried it and i am in love with it, except i can taste too much vinegar. Do You think i can substitute it with lime juice? Hi Camilla, that’s wonderful, I’m so glad you like it, thank you! Yes, lime juice should be just fine. The main thing to keep in mind is that mangoes are a low acid fruit and as such require either high amounts of sugar or an acid (or combination of both like this recipe) to get the pH level right. Hi kimberly, in Indonesia, it is called Mangga Asam Manis. This mango is delicious when cooked..hmmmm now I know your recipes, thanks kimberly for your shared.. Thank you for sharing that and for stopping by! That would be marvelous. I would simply leave out the nigella/kalonji seeds. I am going to try your recipe in the next couple of days. Do you use red jalapeño peppers or red Serrano peppers? Hi Tina, I usually use red Thai chilies because that’s what the grocery stores around here tend to carry. Between red jalapeno and red serrano, jalapenos are milder so go with whatever your heat preference is. waiting on Nigella seeds from Amazon. I am an Indian food addict! Me too, Colin! I love, LOVE the variety of spices in Indian cuisine. If you’ve never tried nigella seeds before you’re in for a treat. They have a really unique flavor that pairs especially well with carbs – sprinkle them on naan bread or incorporate them into the dough and it’s pure heaven! Love this chutney recipe. I’ve made two batches already because after tasting the first batch, I knew I would need more. Plus, I wanted to add more chili pepper in the second batch because I like a little head in my chutney. I’ve already made your chicken recipe with the mango chutney and my family LOVES it!! We had it two nights in a row. Wish I could post pictures. Thanks for sharing these recipes. They will be a mainstay in my family’s dinner rotation. Wonderful, Sharon, I’m so happy to hear that! I always make a double batch of this chutney too because we go through it quickly. I’m thrilled to hear you enjoyed the mango chutney chicken as much as we do! Thanks so much for the feedback! this looks like a great side condiment, thanks ! I wonder if the 2 cups of sugar is necessary ? can I possibly get by using 1 cup ? since I do not care to make it too sweet. Pierre, if you reduce the sugar you’d need to check the pH level to ensure it’s acidic enough for safe canning. You can order pH strips online. However, if you’re not planning on canning it for long-term storage then yes, you can decrease the sugar. I tasted a version of this today that has added raisins. Mixed with some raw shredded beets and carrots (it was a salad bar) it was delicious. I can’t wait to make some of this chutney and play around with creating a summertime slaw with this as the showcased flavor pop. I made this today it taste great just too tangy for me so I adjusted the sugar to my liking,beautiful recipe. This is complete ignorance speaking, but above there was discussion of Major Grey’s chutney. My old UK Good Housekeeping cookbook has Major Marshall’s chutney (plums, pickling spice, garlic, onions tomatoes, malt vinegar, apples, dried apricots, golden syrup, demarara sugar). Do these old Majors have anything in common? Would be happy to give Major Marshall’s recipe in full if anyone’s interested. My red chilli was a Scotch Bonnet. Used 4 mangoes which gave a total weight of 1350 grams of chopped fruit. So just used all your measures except heaped them up! Filled 2X 1lb jar only! Fantastic, Nick, thanks so much! Hi looks fantastic, but I would love to know what % cider you use? Hi Rune, most apple cider vinegars are 5% and that’s what I use. Happy eating! Thank you Kimberly for the nice recipe. I had too many pears at home and I was looking for a chutney basis – I wanted to try to prepare a pear chutney with the ingredients that I had at home. It simply worked great. Chutney is delicious even made without nigella seeds, coriander and cumin (and prepared with brown sugar and pears). Please, keep the good work in this website. Wonderful, Cristina, thanks so much! Can I substitute Apple Cider Vinegar in this recipe? Hi Antonietta, yes you can. I first tried mango chutney a few years ago when a friend from Kenya used it as a sauce for her meat samosas. Since then I’ve been looking for a recipe similar to the chutney I got from her. This recipe looked very close to hers so I tried it out over the weekend as my first canning experience. I can’t tell you how happy this recipe makes me – it turned out so good! I weighed the mangoes at the store to get 1200-1250 grams total, and it ended up making nearly seven 4-oz jars of chutney. The only modification I made was using half a chili pepper instead of a whole one since I’m not a fan of super-spicy foods. I’ll definitely be making this again and will double the recipe next time – thank you! Fantastic, Beth, I’m so happy to hear that, thank you! I made this recipe and am very, very pleased with the result. I live in Thailand and got fed up paying the equivalent of US$6 for a very small jar of imported mango chutney, which I eat with my home cooked curries and with cheese. The end result looked great, though, I found it a little on the sweet side, but, I put this down to the variety of mango that I used. 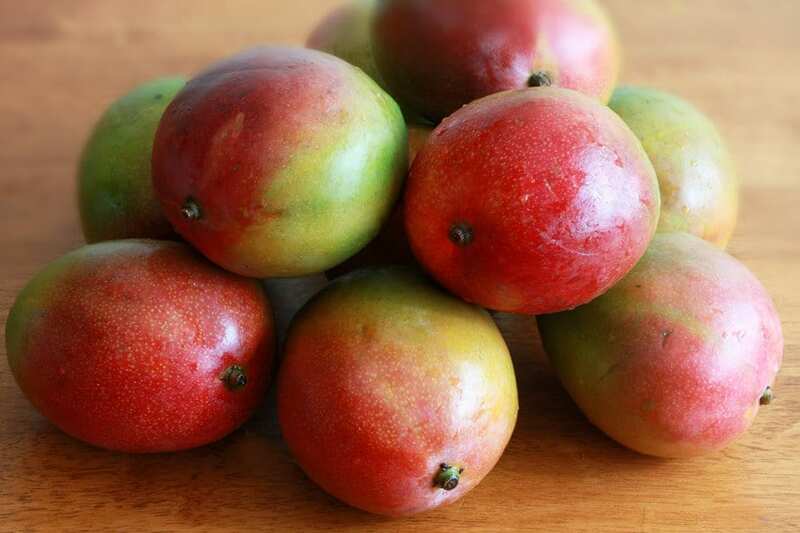 The mangoes in your photos are the same that are available in India and are not available here. I used completely yellow mangoes which are sweeter than the Indian variety. Once this batch has been eaten, I’ll make a new batch using a cup and a half of sugar instead of two cups. I couldn’t find Nigella seeds, so, I substituted cumin seeds which worked very well. Thanks for the recipe. Delicious and it’s saving me a fortune. Wonderful, Erol, I’m so glad you enjoyed it, thank you! Made it again as the first batch got eaten pretty quickly. This time, I used only a cup and a half of sugar, mangoes that were a little less ripe, plus, I found some pineapple vinegar that I thought would go well with this recipe. End result was great! Instead of paying US$6 for a small bottle of imported mango chutney, I paid US$2 for four times the amount (mangoes are cheap here in Thailand). Must check your site for Indian pickle recipes. Fabulous, Erol! Oh yes, it’s MUCH cheaper to make it yourself – and tastes better. I like to use generous amounts of this chutney in my curries so homemade saves a lot of $$. Goes great with cheddar cheese sandwiches, too (I just ate one). Made my third batch today. 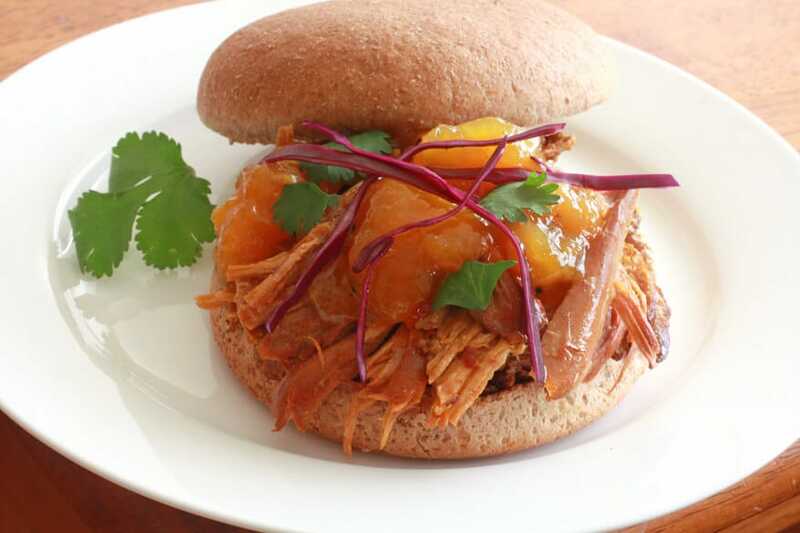 Same way as the second batch, but, substituted a third of the mangoes with sliced fresh pineapple. Came out great and the pineapple adds a certain tang to the chutney. I used fresh pineapple because it is cheap here, but, I’m sure tinned pineapple would work just as well. I’m sooooo glad I ran across this recipe. I’m happy to hear it, Erol, thank you! Absolutely, pineapple is a great choice, especially fresh. Thank you Kimberley for the super mango chutney recipe. I was dying to try it out so set about making it today. Haven’t tasted it yet, but it looks exactly as per your photos. 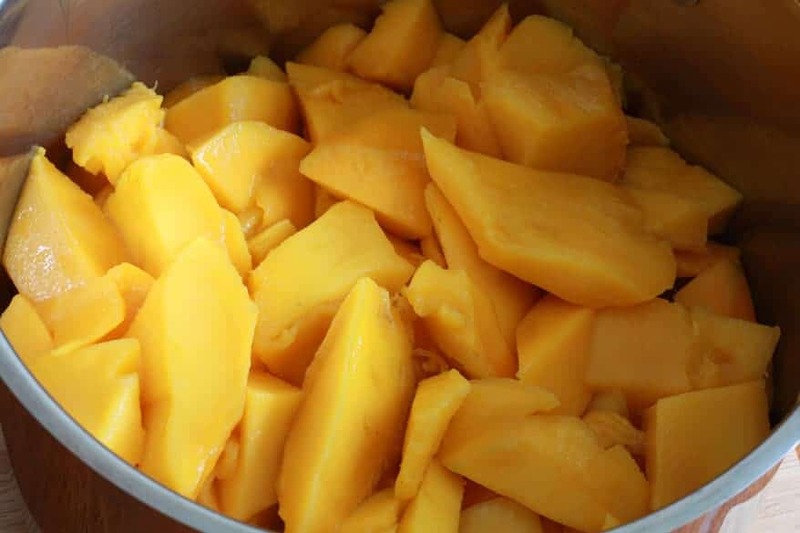 Am a bit disappointed however about the yield – I used 1 kg mangoes, that is 2 weighing 500 grams each, and followed the recipe exactly according to your instructions. And I only got two 318 gr. jars instead of the 5 half pint ones you said. Can you give me your advice about how to up the quantity? I love your blog and ideas. I’m not sure, Felicity, it may have had to do with the size of the mango pits in this particular variety or batch? I’m excited to make this tomorrow! I was thinking about doubling the recipe to use 4 yellow mangos + 8-9 Spring Bright nectarines & 2 habanero peppers. What do you think- do you think that would be a good combo with this? Thanks! That sounds like a yummy combo, G, go for it and be sure to let us know how it went! Great stuff.. I make it all the time to spread on Papadom as an appetizer. I make it hotter with some chilis. I also can some to give to friends. Fantastic, Alan, I’m so glad to hear that, thank you! I’m making this right now after eventually finding Nigella seeds also known as Kalonji. The smell of it cooking is amazing. Fantastic, Barbara, I hope you enjoy it! Okay! so it has been on the stove for an hour and still hasn’t thickened up to a good consistency. I am thinking of just letting it cook for another hour. 1 of the mangos I had was very juicy and the other 3 weren’t so much, so I am thinking I may have gotten more liquid from the 1st mango. Have to say the 1st mango was amazing and bought in the Indian Bazaar where I bought the Nigella seeds. Hi Barbara, yes, you can simply let it simmer a little longer. Keep in mind, too, the sugary syrup will thicken a little as it cools. I came across this recipe 3 yrs ago, been making and gifting it ever since, everyone loves it! I chop and freeze trays of cheap bowens in season, then make up batches all year long. Some fans supply me jars, they like a regular supply, although I do waterbath each batch. Im so happy to have found your recipe, and its the nigella discovery for my other indian rcooking that has also delighted me. Im in Brisbane so we get beautiful mangoes for many months. Also i like the suggestions for substituting pineapple, lime juice, etc. That’s wonderful, Hina, I’m so glad and appreciate the feedback, thank you! making this right now and even though ive only just brought it to the boil the i have tasted it and the combination of sweet and spice is amazing. this one is a must to have in the pantry all year round. i normally make our great great grandmothers tomato chutney to give away at Christmas but was given a huge amount of mangos last week and still have about 15 so looked up chutneys and found this. every ones going to be very happy and wont mind that i didn’t do my usual tomato chutney. also this in comparison to my tomato chutney is very easy and less time consuming. Fantastic, Skye, I’m so happy to hear that and appreciate the feedback, thank you! Well like the previous comments this Chutney is amazing , I found it late last year and have made three batches , friends from all different backgrounds absolutely love it. Like the idea of freezing the mango pieces for use out of season. Just for interest , have used malt vinegar instead of white vinegar? Not in this particular recipe, Colin, but I love malt vinegar and use it regularly. WOW unbelievably good, way better than store bought. Thank you. Super flavour chutney, thanks Kimberly. I have masses of peaches so I substituted peaches for mangoes and that works well. Used my own saved nigella seeds too.